That’s Maths in The Irish Times this week (TM049, or Search for “thatsmaths” at irishtimes.com) is about applications of computer aided design and computer aided manufacture to making dental crowns. Next time you spot a kid immersed in a video game, pause before uttering a condemnatory remark. The spin-offs from computer gaming are benefiting us in surprising ways. Advanced visualisation and animation, developed for gaming, is now at the heart of the digital arts. The film Gravity, which won 7 academy awards, included special effects generated using such software. Mathematics underpins 3-D animation packages. These use some exotically-named methods like affine transformations, spline interpolation and quaternions. The vectors and matrices recently jettisoned from the Leaving Certificate maths syllabus are of key importance. Millions of computations are required to calculate and visualise a complex moving surface such as a face. Although hidden in a black box, invisible to users, mathematics is winning Oscars. I recently had two crowns inserted, thus becoming a beneficiary of CAD/CAM Dentistry (Computer Aided Design and Computer Aided Manufacture). Conventionally, the dentist made a mould of the tooth. This was sent to a laboratory for fabrication of the crowns, so the patient had to wait a few weeks before the job could be completed. Now it is done on the spot by CAD/CAM. Following root-canal treatment, a tooth becomes brittle and a breakage can have awkward consequences. To preserve the tooth, some of the outside portion is removed and a dental crown, like a tiny thimble, is bonded to it, capping the tooth completely. A post may be inserted to provide a strong mounting for the crown. A high-speed camera is used to capture digital images of the tooth. It works at 1000 frames per second, so vast amounts of data are involved. The images are combined, enhanced and processed to provide an animation of the dental arch. The camera uses short-wave blue light to increase accuracy. A 3D digital model of the arch is constructed using specialised software. Intense numerical computation is involved so a powerful computer system is required. The dentist delineates the precise boundary for the crown using a point-and-click technique to select reference points. The points are joined using a fancy curve-fitting computer package. The digital image is then trimmed and sent electronically to a milling machine. High-precision mill for carving dental crowns. The mill uses diamond drills to carve and shape the crown, grinding it out from a solid ceramic block, guided by the digital model. The crown is expected to withstand pressures of about one thousand megapascals, ten times the pressure at the deepest spot in the ocean. The milling process, which takes about ten minutes, is fantastically accurate, with errors of less than 25 microns; for comparison, a human hair is about 100 microns thick. Hand-made crowns cannot match this precision. 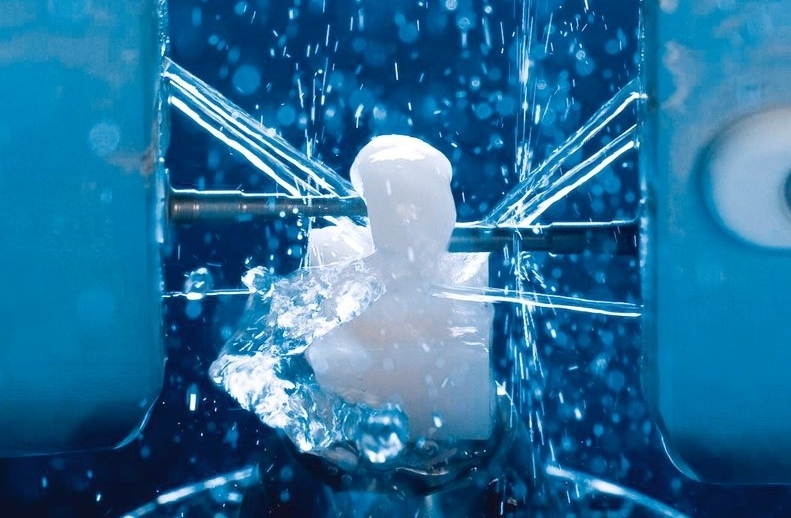 My crowns were made with the CEREC system (CEramic REConstruction), originally developed in the University of Zürich. Each stage is automated. However, the expertise of the dentist is essential to finish the job. After the crown is inserted, it must be carefully adjusted and trimmed to ensure a good “bite”. When this is just right, the crown is bonded to the tooth where it should last at least 15 years. Mathematicians have investigated surfaces of complex geometric form for centuries. Originally undertaken just for fun, their research is now applied to many practical problems. 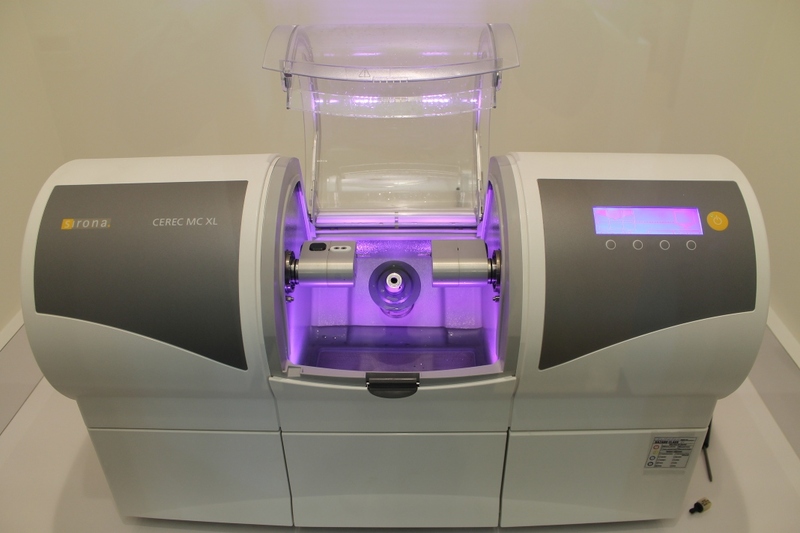 The CEREC system is a clever and remarkably useful fusion of mathematics, computer science, engineering and dentistry.